Prairie 2-6-2 Narrow Gauge Live Steam Locomotive by RMI Railworks: Miniature train and railroad equipment for your club, backyard, or park. The 2-6-2 Prairie Type steam locomotive had been in use in other parts of the world, or built with tanks (meaning, the locomotive’s water hold was a tank mounted directly over the boiler, instead of its typical location, in a trailing tender) since the 1880s. However, a 2-6-2 tender-design was not manufactured until the turn of the 20th century when the Chicago, Burlington & Quincy first put the design into service. Because the Burlington planned to use the locomotives along its granger lines through the farms and fields of the Midwestern prairies the 2-6-2s were dubbed "Prairies." More than 1000 of these locomotives were built. The first Prairie went into service on the New Zealand Railways, built by the Baldwin Locomotive Works, in 1885 more than a decade before the wheel arrangement first saw use in the United States. While most European railroads utilized the tenderless tank design, the 2-6-2T, American lines built theirs with the common format of a trailing tender. The first 2-6-2 was built for the McCloud River Railroad in October of 1898 by Baldwin predecessor Burnham, Williams & Company. This small line located in northern California would only roster three of these locomotives but it began a common theme in how the 2-6-2 would be operated going forward; the McCloud was a logging railroad and it found the Prairie very useful since its small size and extra axle allowed it to operate on light track with sharp curves. Two years later in 1900 the Burlington pioneered the 2-6-2 design for main line freight service, looking for a locomotive to use along its Midwestern routes. Despite their issues on other railroads the CB&Q was very fond of the Prairie type; listed in more than a half-dozen classes from R-1 through R-5 the Burlington came to own nearly 400 examples, by far the most of any singular railroad. The locomotives were built between 1900 and 1912 from the Brooks Locomotive Works (Alco), Baldwin, as well as the CB&Q's own shop forces. The early designs weighed roughly 150 tons with tractive efforts around 22,000 pounds although later examples came in at 184 tons and could produce more than 35,000 pounds of tractive effort. 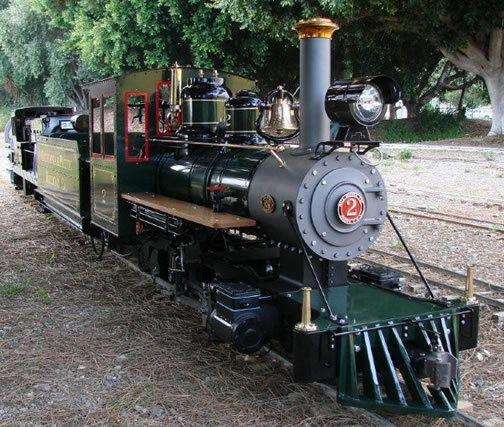 The RMI Railworks Prairie locomotive is available as live steam fired using coal, oil or propane or as a steam outline for indoor use such as shopping centers and malls, using RMI's proprietary electric powered tender with 4 heavy duty 5/8 HP gear reduction motors. The RMI Prairie can pull a very large load with ease no matter how it is powered.